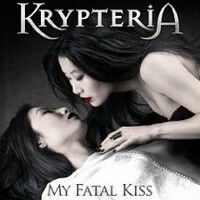 The German band Krypteria with their Korean singer Ji-In Cho is presenting their 3rd full-length album called My Fatal Kiss. With new business partners they are out to show their strength. They kick off heavily with Ignition, a song some might already know... Crunchy riffs, pounding drums and Ji-In's crystal-clear voice. A heavy gothic tune with a Gregorian-like choir and a catchy hook. The title track is even heavier and musically close to NDH, but Ji-In's vocals add melody edge and something fragile to it. The album's lyrics are about good and bad... darkness and light. That's what ties up the songs. A piano opens up Why (Did You Stop The World From Turning), a balladesque tune with fragile passages and some powerful parts. Later in the song they surprise with a neo-classical influenced guitar part where Chris Siemons can show is talent. For Deny they speed up, fast drumming forces them ahead, melodic guitar parts and whispered words as well as a catchy vocal line make this one a sonic roller coaster ride. The lyrics of The Freak In Me show the inner conflict and so probably best the lyrical red fathom of the album. The song shines through the contrast between the heavy guitar and the emotional vocals. With Dying For Love they present a catchy track with symphonic elements, an ear catcher. Acoustic guitar leads slowly into God I Need Someone, a symphonic balladesque tune. Most songs are guitar-driven and so much heavier then this one which has a bombastic edge. Now (Start Spreading The Word) is a heavy anthem with a cool guitar solo. The bonus track Head First Into A Sea Of Flames is combining heavy riffs and melody, but more aggressive then on any other song on My Fatal Kiss! The other bonus track Too Late, Game Over And Goodbye is also quite heavy and surprises the listener with a duet! Krypteria are presenting heavy, guitar-driven tracks with melody and quite often a catchy hook. Check out: Now (Start Spreading The Word), Deny, My Fatal Kiss and Why (Did You Stop The World From Turning).